Pulling out of the marina on the Bennington 2575 QCWA the factory rep explains the construction of the toons. They are two standard tubes on the outsides with a third one that is slightly different in the middle. The middle toon is oval shaped when viewed from the end unlike the round look of the outside one from the same view point. The unusual shape accompanied by additional fins to direct water. The water aids in the speed and boat control. 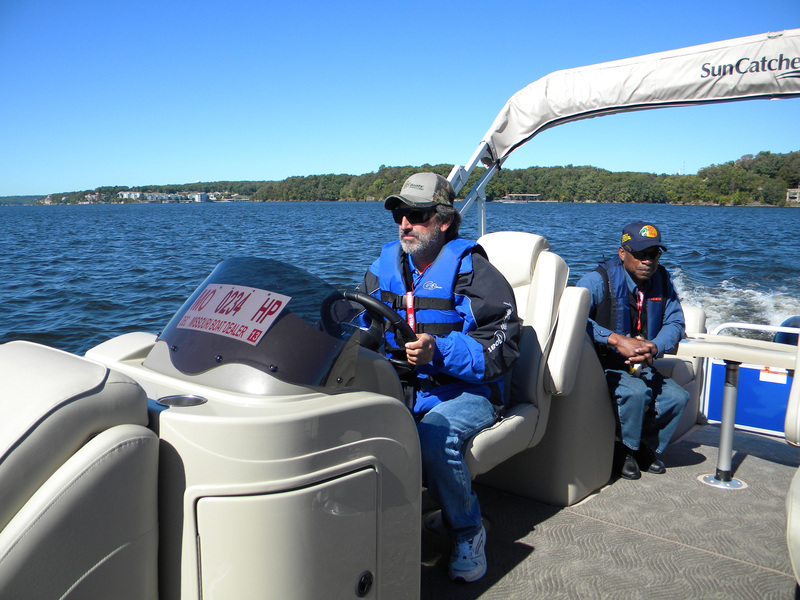 The pontoon boat has power steering to aid in boat control. Taking sharp turns at speed in this 4,500 pound boat is an interesting feeling. There is a feeling of complete control and there is almost no list of the craft. It is a pleasure to tool around the lake today on this boat. 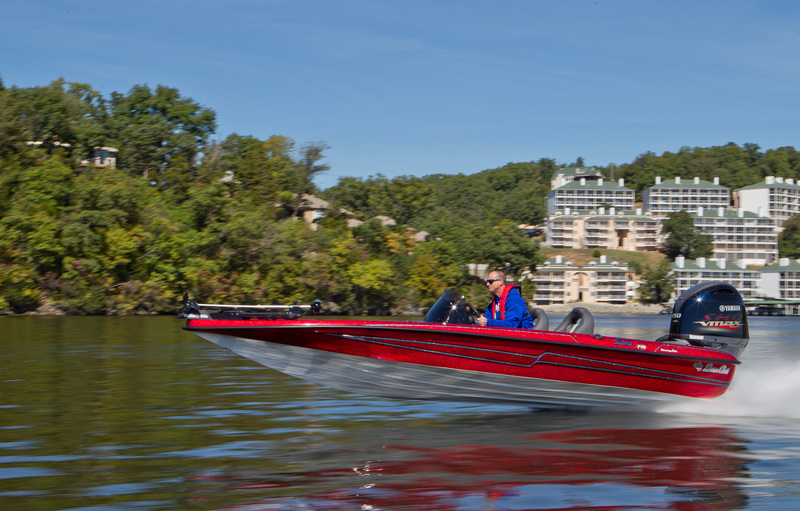 Powered with a Yamaha V6 outboard, the Bennington really moves across Lake of the Ozarks. The engine puts out 350hp. The understated appearance of the craft is deceiving. This is an $80,000 pontoon boat that is the top of the line for Bennington. The helm is elevated to provide a 360 degree unobstructed view. With a maximum speed today of 53mph, having a clear view is important as a safety factor. Another safe feature is the slanted 4-step ladder to allow easy access from the water. The capacity plate rates the boat for 15 people and 2,041 pounds. The tower is actually structural rather than the folding Bimini bar found in most pontoon boats. You can actually tow wake boarders, skiers or tubers with it. The dressing room with a head is a luxury on any boat. Something unusual is a 7-year warranty on the carpet which snaps out for ease of cleaning both the carpet and the boat. Pontoons are great boats for sundown cruises on the lake and this is no exception. The boat really shines in low light situations. It is a lighting marvel. There are underwater lights, cup holder lights, headlights and exterior lights the full length of the boat. The upholstery is heavily foamed and covered with a high quality vinyl that has the look and feel of leather. Settling back on the couches is a great way to end the day and the Yamaha Media Event for this year. Of all the boats available for test rides today this is probably the shortest. Still the ride is comfortable due to a large capacity seating area. The extra leg room is appreciated. The boat is BassCat Sabre. The fiberglass construction cuts through the water with a smooth ride. Powered by a Yamaha 150 VMAXSHO it can handle motors from 115 to 175hp. The total weight of the boat is 1175 pounds. The new VMAX 150 produces speeds up to 57 mph. Under test conditions it produces a 7-second hole shot. This engine fills the niche market of tournament anglers long accustomed to carbureted models. The smooth, quiet performance delivers performance normally expected from larger four-stroke motors. It uses up to 30% less fuel than comparable two-strokes. In testing the craft achieved 6mpg at cruising speed at 26mph and maintained fuel efficiency to 4mpg at over 6000rpm. It comes with a single console but a second one for the passenger side is available. Without the second console, the casting decks are much roomer for the angler. There is a recessed trolling motor well in the bow. Anglers report the recessed foot control aids in the comfort during fishing. A common complaint among anglers is that foot controls create problems with ankle and knee joints as well as back pain. One unusual feature is a glove box under the passenger seat. It is most likely there to make up for the lack of a console where most glove boxes are placed. Behind the seating area are two livewells which combine into one with removal of a divider. There are also two rear dry compartments for more storage. The 33-gallon fuel tank is under the seat. The first step up to the front deck is actually a hidden cooler compartment. The rod compartment is on the passenger side and holds 4 rod holders as well as a rod bungee. There are two long compartments on the front deck to hold more rods and other tackle. All lockable storage hatches also are recessed into the deck to prevent anyone tripping over them. This craft is 18 feet in length and 7 foot 9 inches across the beam. The capacity plate rates it for 4 passengers and 550 pounds. It is doubtful most owners would carry more than two people, as it is a fishing machine not a recreational boat. When at the helm, the ergonomically design allows a good view of all the gauges including a 788 Hummingbird fish locater. The steering wheel is not circular as most boats but six sided. It is comfortable while in motion. Another one is in the bow for use while trolling. The gauges are digital and multi-purpose. There is something comfortable about pontoon boats. They are stable, roomy and multi-purpose. One day they can be a fishing boat with your pals and the next they can be a ski boat or a party boat. The capacity plate provided by the Coast Guard rates this craft for a carrying capacity of 12 passengers and some 1640 pounds total weight. The boat is 22′ feet in length and 81/2 feet wide. The 2,680 pounds moves well with the 150hp motor but it can also hold motors up to 225hp. The fuel tank holds 38 gallons of marine fuel. 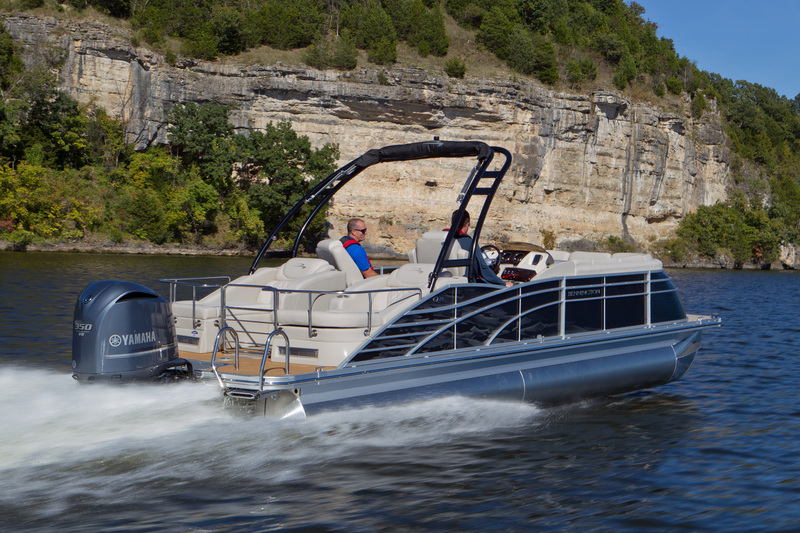 This G3 Boats’ X 322 RC model has a luxury that makes it a joy to ride. Powered by a Yamaha VF150LA outboard with electronic fuel injection it gets about 5 mpg. The 150hp is plenty to propel it through the relatively calm waters here on Lake of the Ozarks. The engine is from the Yamaha V Max SHO 150 series. It delivers clean efficient and quiet performance. It uses up to 30% less fuel than those traditional carbureted two-strokes. This motor is designed for smooth, quiet performance. Three “toons” provide the stability to allow for controlled movement through the waves and ease of turning. Each toon (pontoon) is 25-inches in width and 23-feet in length. A Bimini top provides protection from the rain or sun and folds into the frame out of the way when not in use. The white vinyl upholstery cleans up with ease and the snap in/out carpet allows one to pull the carpet and pressure wash the deck with ease. At the helm are analog gauges, Sony radio system and Garmin GPS/Fish Locator. Floor lighting provides illumination in low light conditions or at night. For those times when towing skiers, tubers, or wake boarders there is a ladder at the stern for easy re-entry. A pop-up changing room permits passengers to change from wet bathing suits into casual clothing to enjoy refreshments while lounging on the bench seating. The bench seating throughout the craft holds dry storage underneath it. There is another large storage unit in the center of the craft. 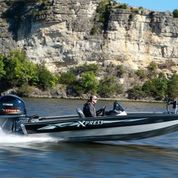 The X-19 Bass Boat with a VF150LA SHO Yamaha outboard is a fishing machine from Xpress Boats of Hot Springs, Arkansas. 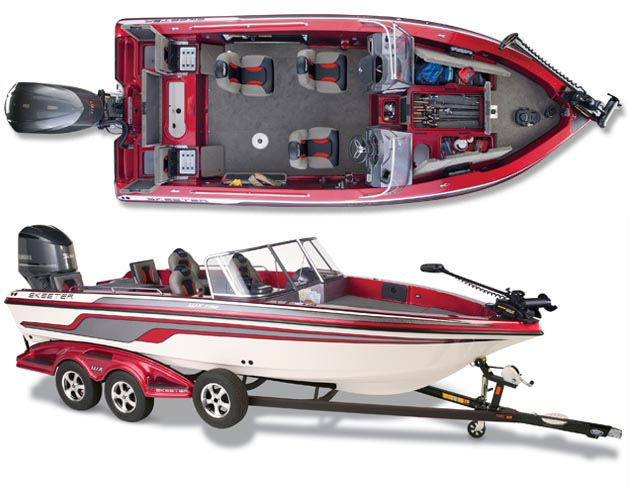 Xpress is one of those family owned companies that have been the groundwork of the bass boat industry for a long time. Other builders have absorbed the old family companies but this one remains in the family. They were the first company in the industry to weld aluminum boats. Up to that time rivets joined pieces of aluminum to form the hull. This X-19 is the midsize of the “Xclusive Series.” The beam is 7′ 11″. The others are a 17-foot and 21-foot crafts. The MSRP is in the high $30,000 but it comes with a standard package of nice features. Of special interest is the “Hyper-lift Hull” which is engineered to provide a quick hole-shot and some great turning. Construction of hull is engineered to also turn down the water spray and provide a dryer ride. The boat has a foam injected insulated hull topped with an aluminum floor with either Xtreme coating or carpet. Capacity of the boat is 4 persons and 700 pounds. With two of us in the boat it is easy to cruise at 42mph with a quiet smooth ride. The emergency ladder is not standard. But, there is an optional one available. In the forward deck is a recessed foot control for the 80 pound thrust Minn Kota Fortrex trolling motor. In addition to the trolling motor there is a graph and trim control up there as well. The center storage compartment is for rods. The compartments on each side are dry storage. This particular boat has only one console to provide additional room on the casting deck. But a second console for the passenger side is available. The Hummingbird 858c HD Di Combo Graph/GPS is mounted in the helm of this tournament craft. The Euro style seating is very comfortable and helps provide a smooth ride. The 30-gallon recirculating livewell is located immediately behind th3e seats. Beyond that is the fuel and battery compartment. To the side on both the port and starboard sides are dry storage for tackle and PFDs. The Electronically Fuel Injected Yamaha 150 VMAX weighs 480 pounds and is popular with bass anglers who are changing over from previous models in the VMAX series. It gets a little over 6 miles per gallon of fuel. It provides the same quiet, responsive performance Yamaha users are accustomed to enjoying. Fire and smoke belch out of the barrel. Once the smoke clears we have the opportunity to see if the bullet found its mark. Just as our forbearers in the Midwest did we are hunting public land of which there is precious little in most states. Hunting public land means we have to make good use of scouting materials. Topographical maps provide information about natural funnel areas and elevations. Trips to the area can provide other information such as vegetation, feeding and bedding areas as well as deer trails. With more hunters taking to the woods each year some are opting to hunt with primitive weapons. They have such reasons as: taking advantage of special muzzle loader seasons, additional time in the field, the challenge of a primitive weapon, and a way of combining the technology of modern firearms with the skill needed to hunt with an ancient weapon. The muzzle loading hunter is forced to hone hunting skills in order to overcome the limitations of the weapon. One has to hunt harder and get closer. He must learn to safely use his weapon and carry out exacting loading procedures to ensure the life of his weapon and his own safety. Lacking patience then muzzle loading may not be the right way to hunt. The muzzle loader is usually either a flintlock or caplock weapon. 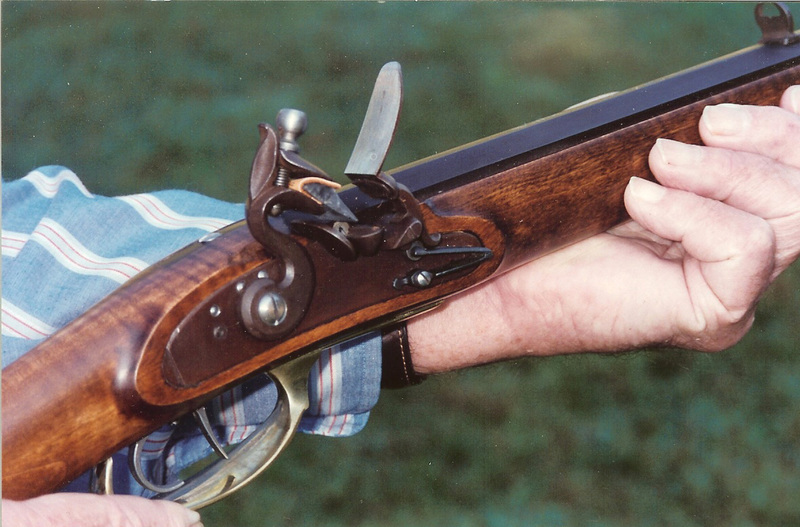 The modern muzzle loader is often a reproduction of an older weapon. Shooting antique firearms is not a good idea as they can be damaged and lose much of their value. Additionally, could explode from some hidden defect. A third option is the in-line muzzleloader. The flintlock weapon requires one to fill a pan with fine priming powder and snap a frizzen over it before cocking the hammer. The hammer strikes the frizzen when released by the trigger. The resulting sparks ignite the powder which ignites the powder in the barrel discharging the bullet out of the barrel. With the percussion cap, the cap takes the place of the priming powder and frizzen. The hammer strikes the cap causing an explosion that in turn ignites the powder in the barrel. Caplocks also come in several systems that make use of primers from shotgun and rifle cartridges. Most muzzle loader hunters use a propellant called Pyrodex, a black powder substitute that is easier to store and use as well as being more reliable under differing weather conditions. For the public land hunter, using a muzzleloader can be an advantage due to the season being later in the year than traditional shotgun or rifle seasons. The deer tend to bunch up due to the bad weather. Some hunters see muzzle loader seasons as extensions of the archery seasons. It is a matter of being a primitive hunter. Deer are bunched up and it is difficult to outwit multiple sets of eyes in search of danger. Some hunters move to the treestand instead of stalking. Biologists tell us that the white-tailed deer is a creature of the edge habitat. In the late muzzle loading seasons, deer are pretty much through with the rut. They form the small family groups are very wary having just gone through most of the hunting season. Deer will usually be found on field edges early in the morning and early evening. Most of the does will have been bred and the bucks are not frantically looking for them. This makes both more alert to a hunter=s presence. By working habitat that is near water and grain fields, one improves his odds of finding a good deer trail. It is important to find where deer travel. Find routes that they take between bedding and eating or drinking areas. One can place a treestand along that route for optimum results. Large public land tracts have dozens of locations that fit this description. Large tracts create tremendous edge cover as timber borders agricultural land. The terrain can range from timbered slopes to rolling, grassland fields. Many deer hunters do not like to hunt public areas. They do yield some fine bucks. Regulations on public hunting areas are often more restrictive and many site specific rules apply. It is a good idea to check with the game officials in charge well in advance of a planned hunt. Most sites have fact sheets that list site specific regulations. One does not have to be a gun or history buff to enjoy the challenge of muzzle loader hunting. It can provide an interesting step back in time to the basics of hunting. Pursuing a deer is a challenge under the best of conditions. With a muzzle loader it is even more rewarding. In recent years the move of some tournament fishermen seems to be gradually from bass boats to the multi-species boats. They like the deep V-hull for days of inclement weather and also for those family excursions. With present economic conditions, some families cannot afford a boat devoted exclusively to bass fishing for their recreational activities. Multi-species boats provide a more varied machine. To meet this need Skeeter developed this boat in 2012. Its goal is to provide a multi-species high end fishing boat. The Skeeter MX 1825 provides 18-feet of fishing machine with a 97-inch beam. It has an interior depth of 21-inches and a 14-inch draft. This model is equipped with an F200XB Yamaha outboard. Fuel tank contains 33-gallons. It has a maximum horsepower of 200hp. Mounted in the helm, a visually good position above the steering wheel is a big screen Hummingbird 898 HD fish locator. The hole shot is quick enough to meet the desires of most bass anglers as they move from location to location. The boat tracks straight and the boat is up on plane very quickly. It has a nice short turning radius also a positive for bass anglers. According to Yamaha engineers this line of motors has Variable Camshaft Timing (VCT) to advance or retard timing on the engine rpm. It has great low and mid-range punch for that hole-shot when needed. Once out of the harbor the boat was up on plane and doing about 30mph in about 4 seconds. The throttle valve precisely controls the airflow which boosts low and mid-range torque for better acceleration. We were able to enjoy a smooth and secure ride at 52 mph with little strain on the motor at 6,000rpm. One immediately apparent feature of this particular boat is a MinnKota trolling motor with a 60-inch shaft. The 80-pound thrust requires 24-volt battery. The bow mounted trolling motor slides back when in the deck rest position. This allows space to protect it during trailing. The electronic pilot maintains the boat in position of 5-feet from the anglers target by using GPS. Behind the seat in the center position is a 50-inch 25-gallon live well with a bracket to hold a bait bucket. On either side are dry storage lockers. There is special side wall rod storage and a new rear casting platform area. The idea is that the boat provides a low profile for stable fishing on windy days. As with many boats this year the Skeeter MX 1825 has an emergency ladder to allow anyone in the water to get back into the craft. The Coast Guard capacity plate rates this boat to carry 6 persons and 880 pounds. The carpet is snap-in/out for ease of cleaning. Easing out of the marina the bright sun on the Osage River at Lake of the Ozarks brings warmth but also problems for photography. With a number of boats to test, it is just a matter of making do with what is available. The comfort of the Hurricane SunDeck 2690 OB is luxurious and fits right nicely with the quiet F300 Yamaha outboard engine. The capacity plate indicates that it is Yacht Certified instead of numerical indication of number of passengers and load limits that are more common on small freshwater craft. This means that the Coast Guard says it is to carry a reasonable load. The NMMA certified construction includes foam flotation and automatic bilge pumps. The stringers are all fiberglass as is the hull. The design is such as that displaced water does not touch passengers. This unit has the standard white vinyl seats with snap-in carpet for ease of cleaning. The stern deck was of teak which is optional. The teak is easier cleaning and yet not as slippery for water skiers emerging from the water. Speaking of skiers, tubers and wake boarders, this unit has a tow bar around the motor to prevent ropes from entangling in the prop. Both the bow and stern have fold up e-ladders. With high gunnels an e-ladder is essential for anyone in the water to be able to get back in the boat. The telescoping ladders fold away when not in use. The specs over all for the boat include that it is 26 feet 4-inches in length with a beam of 108-inches. Although it can take outboard motors up to 350 horse power, ours is a 300 Yamaha four-stroke. It will hold 96-gallons of fuel. There is something comfortable about the high gunnels and the plush cushions throughout. Family members can securely move about without fear of an errant wave unexpectedly casting them into the water. Dock and ladder lights come in handy in low light conditions. Bench cushions are throughout the deck with a captain’s chair at the helm. At the help the dashboard holds gauges that at first glance appear analog but are actually digital. The displays are multifunctional. The 5-inch, single LCD display, is designed for configuration by the user. This is Yamaha’s Command Link Plus system. The screen can display oil/water pressure, charge level, rpm, fuel flow rate, tank levels, water temperature and water depth. It operates with single, twin or triple applications. The head with a sink enclosed below deck has easy access. A fold up-changing room of fabric provides privacy for changing in and out of wet clothing. Other amenities are ample cup holders, a table mounted in the stern, a refrigerator, freezer, grill, another sink and waste compartment. There are other features in the various packages offered by dealers that are too numerous to name here. Suffice it to say this is a well-made and luxurious deck boat. As for the F300XCA motor, it weighs 562 pound which is much lighter than similar products of the past. It has a maximum horsepower of 300 hp with electronic fuel injection (EFI) and displaces 4.2 liters. The gear ratio is 1.75.